This remarkabe picture was taken at the Swiss ski resort of Crans-Montana on January 19, 2004. 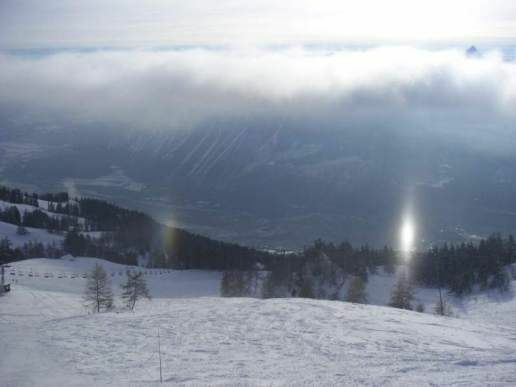 The image shows a subsun, a pure reflection halo that is caused when sunlight reflects off plate-shaped ice crystal. A subsun is always situated exactly as far below the horizon as the Sun is above it. It is often observed from airplanes. This specimen was brilliant enough to create its own "sub-sundog" which is clearly visible as a rainbow-coloured patch on the left side of the image. See close-up in next picture.